You'll be £4.99 closer to your next £10.00 credit when you purchase Seafarers' Voices 7: Captain's Wife. What's this? During the nineteenth century it became increasingly common for merchant service masters to take their wives to sea, particularly in the whaling industry, where voyages of 2-3 years were not uncommon. Reflecting the sailor's traditional dislike of women on board – seen as unlucky by the superstitious and disruptive by the more rational – these ships were derisively dubbed 'Hen Frigates' and although they have been the fashionable subject of academic interest in recent years, there is not much literature by the women themselves. Among the first, and most accomplished, is Abby Jane Morrell's account of a voyage between 1829 and 1831 that took her from New England to the South Pacific. Her husband Benjamin was in the sealing trade but was a keen explorer, and his adventurous spirit led him – and his wife – into situations normally well outside the world of the Hen Frigate. Curiously, Benjamin also wrote an account of this voyage, but since he was described by a contemporary as 'the greatest liar in the Pacific', his wife's is a better record of what actually happened, even when dealing with dramatic incidents like the murderous attack by cannibal islanders. Apart from the descriptions of exotic places, much of the interest in this book is the traditional, centuries-old world of the sailor as seen through the eyes of a thoughtful and well-educated woman. As such it heads a long line of 'improving' books aimed at ameliorating the seaman's lot. Captain's Wife gives the reader a woman's perspective on life at sea aboard a schooner when conditions under sail were uncomfortable and, at times, dangerous. Morrell’s descriptions of the places visited, the Cape Verde Islands, Tristan da Cunha, New Zealand, the Philippines, Singapore, and South Africa, are fascinating and well observed. The narrative contains exotic locales, as well as the customs and superstitions of the mariners with whom Morrell travelled. 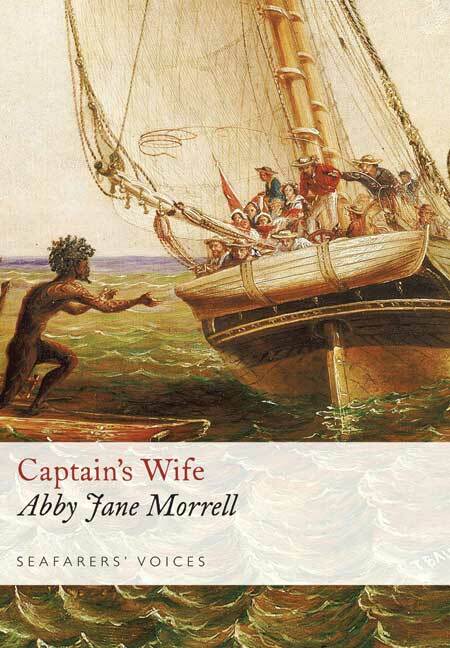 As the captain’s wife, Abby Morrell didn’t mix with the sailors, but she shared the dangers of the sea with them. A handy pocket sized volume that will fit nicely on any yachts bookshelf. This is as much a voyage of exploration as a trading venture and as such is a well written and edited account. This book is highly entertaining and readable, and more than once readers will find themselves holding their breath, sitting on the edges of their seats, and marveling at Abby's examination of life on a ship and in exotic ports of call. By turns feisty, opinionated, inquisitive, and contemplative, Abby Morrell lives and breaths on these pages. Many will want to read Captains Wife as a tale of adventure, but what has stayed in my mind is the character of the incomparable toung woman who told these tales. Recommended. Much has been written of such vessels, but there are few first-hand accounts left to us by the woman themselves, and of those that remain, Captains Wife is widely acknowledged to be the best. The account is fresh after all the years that have passed since she wrote it. It opens up the world of whaling and sealing and the exploration of the pacific. This is a book that absorbs and rewards the reader. Highly recommended. A highly readable piece of work. There is much within the 184 pages that will resonate today- the hazards of the sea and the pressures on shipmasters being among them. The oldest account of a deepsea voyage written by the wife of a shipmaster.